Our driver will meet you in Aqaba and then leave city life behind to venture into the "Valley of the Moon" - Wadi Rum. The winding, hilly road meanders away from Aqaba and suddenly turns into a flat red and orange sand sea with sandstone mountains emerging from its floor. In Wadi Rum, experience the desert as the Bedouin have for centuries during a 2 hour camel safari. After, we will stop for lunch at one of the camps for a Bedouin meal and tea over the fire. When the time is right, experience one of the best rides of your life duirng a 3 hour sunset 4x4 safari through some of the most breath-taking landscapes in the Middle East. After return to the camp for a traditional Bedouin dinner around the campfire and overnight camping. Breakfast at the camp, then get an upclose and personal view of the desert landscape during a 2 to 3 hour trek with a local Bedouin guide. Imposing, towering rocks and crags “God’s skyscrapers” rise up from Rum’s desert floor and the silence seems to thunder through the canyons. Famous for its rugged mountains and colored sand dunes, this is without doubt a place where heaven and earth come closer together. After, continue to Little Petra via King's Way - one of Jordan's most breathtaking and scenic routes. Little Petra is believed to be a retreat for affluent Nabateans. Enter the site through a narrow gorge called Siq al-Baird to view, within the ancient dining area, some of the most important surviving examples of Nabatean paintings. Dinner and overnight in Petra at 3* hotel. Breakfast at the hotel, then begin the day in the Rose Red city of Petra. This city of the Nabataean's was built over 2,000 years ago and lays hidden in a huge rocky mountain accessed via a high and narrow gorge. With monumental facades and spectacular buildings sculpted out of solid rock, this breathtaking site has been described by UNESCO as "one of the most precious cultural properties of man's cultural heritage," and also one of the New 7 Wonders of the World. Upon arrival at the Petra Visitor's Center, we will arrange a 2-3 hour guided tour with an English speaking site guide to explore the main attractions of the lower part of the city starting from the main gate all the way through the kilometer-long Siq to visit the Treasury, Street of Facades, the Theatre, all the way down to the Nymphium and Qaser El- Bent. Have lunch inside Petra at Al Basin Restaurant then some free time on your own to explore further. After, return to the main gate to meet our driver to continue to your 3* hotel in Petra for dinner and overnight. Breakfast at the hotel, then on this morning, experience a very unique way to explore the area - an Arabian thoroughbred horse ride through the stunning mountains of Jordan. 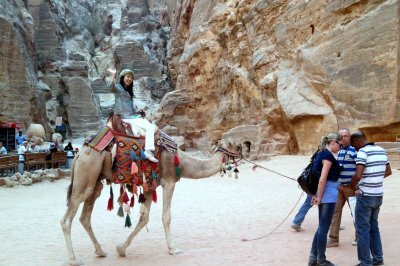 With an English-speaking guide, this adventure journeys through the area of Petra where there is a magical view over Wadi Araba, Petra, and Little Petra. Both experienced and less experienced riders can make the tour. A boxed lunch is also included during the adventure. After, meet our driver to start the return drive to Aqaba.